The National Film and Video Foundation (NFVF) will once again host a South African Pavilion at the Cannes International Film Festival. The festival takes place in France (Cannes) from the 11th until 22nd of May 2011. The Cannes International Film festival has been recognised as the most prestigious film festival on the global calendar and the participation in it through exhibition or competition is considered a "must". The NFVF on a yearly basis leads the SA delegation and facilitates the country's presence at the festival. 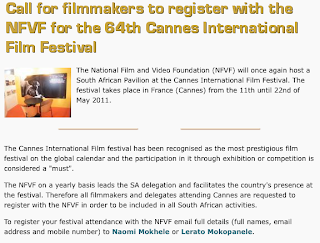 Therefore all filmmakers and delegates attending Cannes are requested to register with the NFVF in order to be included in all South African activities. To register your festival attendance with the NFVF email full details (full names, email address and mobile number) to Naomi Mokhele (naomim@nfvf.co.za) or Lerato Mokopanele (leratom@nfvf.co.za).